The outcome of the 2017 General Election has ultimately redrawn the political landscape of the country, the allegations of flaws of the electoral process itself notwithstanding. The elections have on the one hand given Jubilee Party's President Uhuru Kenyatta another five-year term in office, and on the other totally cut off his main challenger, Nasa leader Raila Odinga's political ambitions. The former Prime Minister had indicated ahead of the Tuesday poll that this would be his last time to participate in elective politics. Also hanging precariously on edge of the political cliff are careers of Mr Odinga's running mate Kalonzo Musyoka and Pentagon members -- Mr Musalia Mudavadi and outgoing Bomet County Governor Isaac Ruto. However, the gamble by Mr Moses Masika Wetang'ula to defend his Senate seat in Bungoma county paid off. "Since the resurgence of multiparty politics, elections in Kenya are typically marked by allegations of rigging and mismanagement by biased electoral bodies and this one is not any different. Be that as it may, Jubilee has emerged resoundingly victorious in the presidential race as well as winning more seats than Nasa in the National Assembly, Senate and county assemblies - a factor that ushers in a fundamental shift of Kenyan politics," observes one-time Cabinet minister, Prof Amukowa Anangwe. Owing to the advantage of numbers in Parliament, coupled with the power of incumbency and Mr Odinga's possible absence from the political scene, Prof Anangwe sees a tough ride ahead for the Opposition in the next five years. "First, the Deputy President (William Ruto), who now views himself as president-in-waiting, will be more explosive and ruthless than ever before because he will be fighting for his own political life against the Opposition. Second, the probable exit of Raila from the scene and lack of a fitting substitute in terms of persona, grit and dynamism will be a major factor of despair," says Prof Anangwe, who teaches political science at the University of Dodoma in Tanzania. Prof Anangwe points at a crisis of confidence amongst the electorate in the Nasa zones as a third and key factor that could terribly weaken the Opposition forces - thanks to the likelihood of disenchantment with opposition politics and the temptation to shift support to government side. On the latter score, the Jubilee duo of Mr Kenyatta and Mr Ruto seemed to have schemed well to spread their wings across the country and lock out potent competition from key rivals. The victories of Joyce Laboso over Isaac Ruto in Bomet and Machakos County Governor Dr Alfred Mutua over Wavinya Ndeti, for instance, are warning shots to Nasa bigwigs, Isaac Ruto and Kalonzo Musyoka. Tuesday's outcome means Isaac Ruto, who has been engaged in a supremacy battle with his namesake, the DP, is now momentarily caged. Similarly, the outcome in Machakos appears to elevate the stature of Governor Mutua at the expense of former Vice-President Musyoka's career. And there is also Charity Ngilu, Mr Musyoka's perennial political foe turned ally, who clinched the Kitui County governor's seat. With Dr Mutua and Mrs Ngilu in office, there are chances the ground could shift from Mr Musyoka's grasp during his absence from elective politics. Meanwhile, the outcome of results in western Kenya appears to have further opened the region to political competition ahead of 2022. The President's party registered an unlikely win of seven parliamentary seats. Although Mr Odinga largely won the presidential vote, this development effectively gives Jubilee some footing in the Opposition-leaning region. The big losers at parliamentary level in this region are Mr Odinga's Orange Democratic Movement (ODM) that lost nearly four seats and Mr Wetang'ula's Ford Kenya. The biggest harvest, though, went to Mudavadi's Amani National Congress. However, at the gubernatorial level, ODM increased its tally and it is in charge of all the counties in the former western Kenya, except one - Bungoma. From the way the results have panned out, the region will continue to live up to its billing as "a most sought-after political bride". The election outcome also means the President will exit from elective politics in the next five years. This offers the political class in Central Kenya the tough task of identifying a Mr Kenyatta replacement. With the exit of big guns, outgoing Kiambu Governor William Kabogo and unsuccessful gubernatorial seat contenders Ms Martha Karua and Peter Kenneth, this exercise promises to be tough. However, the return to Parliament of former Cabinet ministers Amos Kimunya (National Assembly, Kipipiri) and Njeru Ndwiga (Senate, Embu), could serve to increase the succession pool. Other high-profile names include Ms Anne Waiguru (former Cabinet Secretary) and Mr Francis Kimemia (former secretary to the Cabinet) who have been elected governors of Kirinyaga and Nyandarua counties respectively. Similarly the anticipated exit of Mr Odinga could leave the Luo Nyanza region politically orphaned. Fate has placed his close allies - former Cabinet ministers and high-profile politicians from the region, Prof Anyang Nyong'o and James Orengo - on different paths. Prof Nyong'o has settled for a less politically active job as governor of Kisumu county, while Orengo is Siaya County senator. At the Coast, Mombasa County Governor Hassan Joho remains the kingpin but Jubilee has effectively managed to prop up a checkmate, who is Kwale County Governor, Salim Mvurya, But the biggest gain for the ruling party is the successful electoral coup in Nairobi, where their man, Mike Sonko, has been elected governor. It has always been the wish of the President to have a member of his party as the governor of the capital city. Mr Sonko will also, for the first time, be in good company of the first MP from the Kalenjin community in Nairobi - Jubilee's Nixon Korir, who has been elected Langata legislator. Mr Korir is just one of the MPs who registered history in these polls, including 23-year-old university student, John Paul Mwirigi, who was elected MP for Igembe South, Meru County, on an independent ticket. 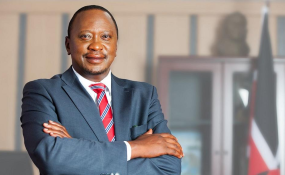 Overall the Jubilee party scooped more elective seats and political commentator, Prof Peter Kagwanja, says this fact demonstrates Uhuru's genuine win in the presidential poll. But Rarieda MP-elect Otiende Amolo argues that a parliamentary majority does not necessarily reflect the presidential vote. The lawyer, who is a member of Nasa's legal team, holds that the presidential poll was flawed. He attributes the disparity in Nasa's presidential and parliamentary figures to internal competition among parties, thereby dividing votes among their candidates and the possibility that some politicians were elected on account of their individual qualities and not party affiliation. In 2007, Party of National Unity's Mwai Kibaki was declared winner of the presidential vote yet his party secured slightly under 40 per cent of the parliamentary seats. Even with a boost from Mr Musyoka's ODM-Kenya at the time, following a merger, the numbers were still inferior to Mr Odinga's ODM party. The Tuesday poll gives President Kenyatta even more numbers in the two Houses than was in the Eleventh Parliament, where Jubilee enjoyed the so-called "tyranny of numbers." The party's vice-chairman, Mr David Murathe, says the numbers in Parliament will enable the President to fully execute his agenda for Kenyans. Mr Murathe predicts that this time, Mr Kenyatta will be stronger in resolve to realise his goals. In the meantime, Prof Anangwe says that the Opposition top brass has only two options - to undertake an exhaustive poll post-mortem guided by a number of solid proposals to bounce back or stick to the Opposition clueless "with the risk of their stars fading amongst their bases."